Summer has arrived for much of the country, and many people are looking for cheap ways to entertain themselves on their staycation. While amusement parks and sporting events like baseball games are exciting, they can also be expensive. Lawn games, on the other hand, offer fun for the whole family right in your own backyard. Here are five games that cost little to play, but can be hours of fun. All you'll need is some cheap equipment and a nice field of grass. Certainly the most vigorous of the five lawn games discussed here, Ultimate Frisbee (nicknamed Ultimate) is a great game for those who love to run, jump, and chase flying objects. It has similarities to flag football, but uses a disc instead. And one of the great things about Ultimate is that there's no contact permitted, including no blocking or screening. Ultimate is played on a 70 x 40 yard field, with 25-yard end zones, and with seven players to a side. The side playing offense attempts to throw the disc downfield to a teammate, while the opposition attempts to intercept or knock down the pass. Should that teammate make the catch, the play advances to that spot. Running after the catch does not count. The offense continues to move down the field in this way until they score or throw an incompletion or interception, at which time the other team goes on the offense. As you can guess, the quality of play all depends on the ability of the thrower to make an accurate toss. Experienced players have an arsenal of throws they can make, known by names such as the flick, scoober, thumber, and the hammer. Best of all, Ultimate requires a minimal amount of equipment. 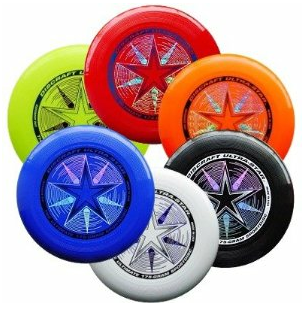 The Ultimate Bundle, 6 Discraft Ultra Star Ultimate Discs ($45.77 with free shipping, a low by $54), are the official discs of USA Ultimate. Here is a complete set of six discs in variety of colors that are all regulation 175 grams and 10.75 inches in diameter. Six discs seem like overkill? Pick up a single regulation Discraft Ultra Star Ultimate Disc in your favorite color (from $5.90 with $5.49 s&h, a low by $2) and get tossin'. The lawn game of croquet dates back to at least 1850s England, and is a derivative of ground billiards. Back then it took the country by storm; some Wimbledon courts were originally croquet courts. It's an all-ages game, perfect for kids through seniors, and it's played at a relaxing pace and requires little strength (although those who play it professionally might quibble). A well-played match can even offer a mile or two of leisurely walking. The game equipment consists of mallets, wooden balls, wickets, and a stake or two. The course can be laid out to fit the grassy lot at hand, although the official dimensions are 35 x 28 yards. Wickets or hoops are laid out in a figure-eight pattern, and the goal is to hit your ball along the ground and through each hoop in order, then strike the stake. There are additional, more varied rules under which the game can be played. The fun and competition comes in purposely hitting the balls of your opponent, for which you are rewarded with additional strikes of your ball, and the right to whack your opponent's ball into oblivion. 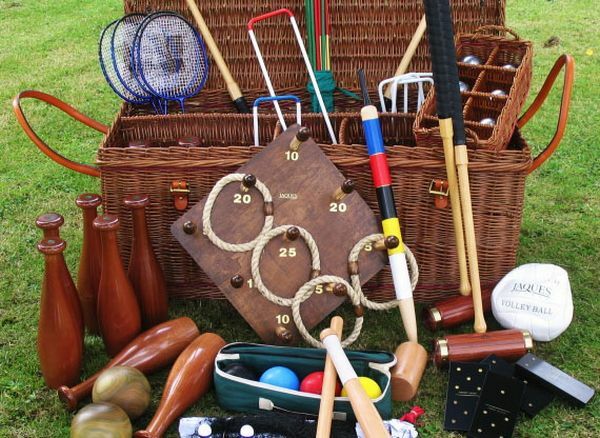 Speaking of whacking, the only caveat to croquet is the questionable wisdom of giving too-young participants mallets, which could cause a little damage in a tantrum. 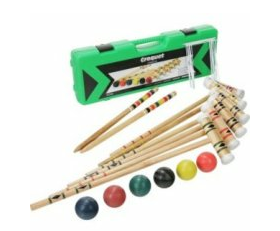 The Halex 6-Player Croquet Set ($52.49 with free shipping, a low by $1) is just about all you'll need to set up a game of croquet for six players. It included the necessary hardwood mallets and balls. The game of tennis can be fun for the adept, but the average Joe can spend more time retrieving errant shots than actually volleying. And then there's the need for a proper tennis court. Badminton on the other hand, while sharing some of the same dynamics, is a much more casual and adaptable game. Instead of a ball, badminton uses a shuttle: a ball with a cone of feathers stuck to one side. This rapidly slows down even the most aggressive shot as it travels through the air and over the net, thereby gibing the opponent a chance to return the volley. Also, all serving is done underhand, so it is easier to get an exchange going. The shuttle is not mean to be bounced on the ground before it is hit, so you don't need to play badminton on a dedicated court. Just set up your badminton game on nice grass lawn for optimal play: stake in the net — which is higher than in tennis games — and put a greater arc in your shot, and you're set for hours of fun. The game can be played as singles or doubles and the object is to earn 21 points to win the game. All you need are a few inexpensive pieces of equipment. 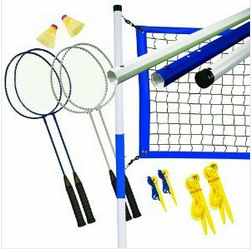 The Franklin SportsIntermediate 4-Player Badminton Set ($30.59 with free shipping, a low by $6) comes complete with four racquets, a few shuttles, the net, poles, stakes, ropes, and a carrying case. It's hard to guess just how long horseshoes have been tossed competitively; one could well imagine Genghis Khan's army throwing them around when taking a break between sackings. But certainly, the game is a tieback to America's agricultural heritage. To play horseshoes, you don't have to find a horse and steal its shoes. In fact, the game is played with specially-made three-sided shoes that would never fit a steed. A standard competitive horseshoe is 2.5 pounds and around six inches across. With 'shoes in hand, grab your partner and head to an allotted space about 40 feet long. Drive a stake into each end of the field and you're all set up. While an ideal horseshoe pit would be filled with sand, you can play it on grass. Now for the skills: stand at one end of the field next to the stake, and hurl your horseshoe so that it collars the opposite stake. If you can do this, you've just scored three points by landing a "ringer." If not, you're awarded one point per horseshoe that comes within six inches of the stake. Seems simple, right? The motion of horseshoe pitching is reminiscent of bowling, except that experienced pitchers hold the shoe so that it make a revolution and a quarter or a revolution and three-quarters before reaching the post. Ready to play? 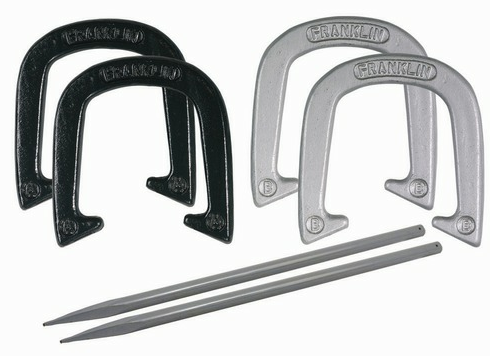 The Franklin Sports Advanced Horseshoe Set ($39.99 with free shipping, a low by $7) has four regulation 2.5-lb. horseshoes (two brass-plated, two chrome), two 24" chrome-plated stakes, and a carrying case. Another game that evokes our farm history is corn hole, also known as tailgate toss, bean bag toss, corn toss, or baggo. It's certainly among the simplest of games anyone can play. And it's easy to set up, too. 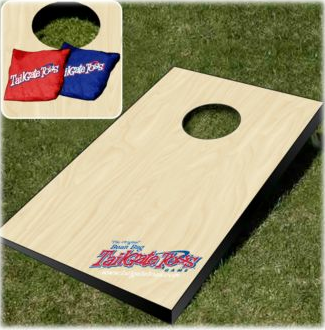 The necessary corn hole equipment consists of two 2' x 4' boards with legs that tilt it up slightly. They'll also need a hole: six inches should do. These two boards are then set up so that there is 33 feet between the holes. Much like horseshoes, participants stand next to one board and hurl fabric bags that contain beans or dried corn, aiming to drop them into the hole in the opposite board. A hole shot is good for three points. Any bag landing on the opposite board and sticking to it is worth one point. Many people find building their own corn hole setup a pleasant home project, but there are also commercially-available sets. The Wild Sage Original Tailgate Toss ($51.11 with free shipping, a low by $3) includes wooden boards with swing-out legs and eight bean bags. Why spend this summer inside an air-conditioned cave watching reality TV or sports when you can enjoy the actual exercise, camaraderie, and competition yourself? Invite your friends over for a couple of lawn games and you'll be surprised how much fun summer can be, even on the cheap. 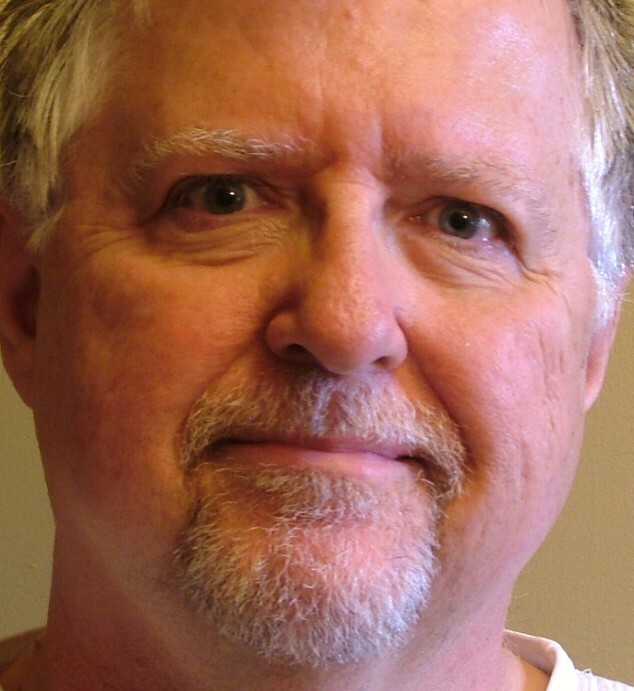 Follow @dealnewsfeatureon Twitter for the latest roundups, price trend info, and stories. You can also sign up for an email alert for all dealnews features.